Kali Linux makes things difficult for beginning Linux users. Moreover, these difficulties begin to arise at the stage of downloading the distribution. It is quite understandable, there are 5 official download pages, and more than 10 options have been proposed on the page with main versions. 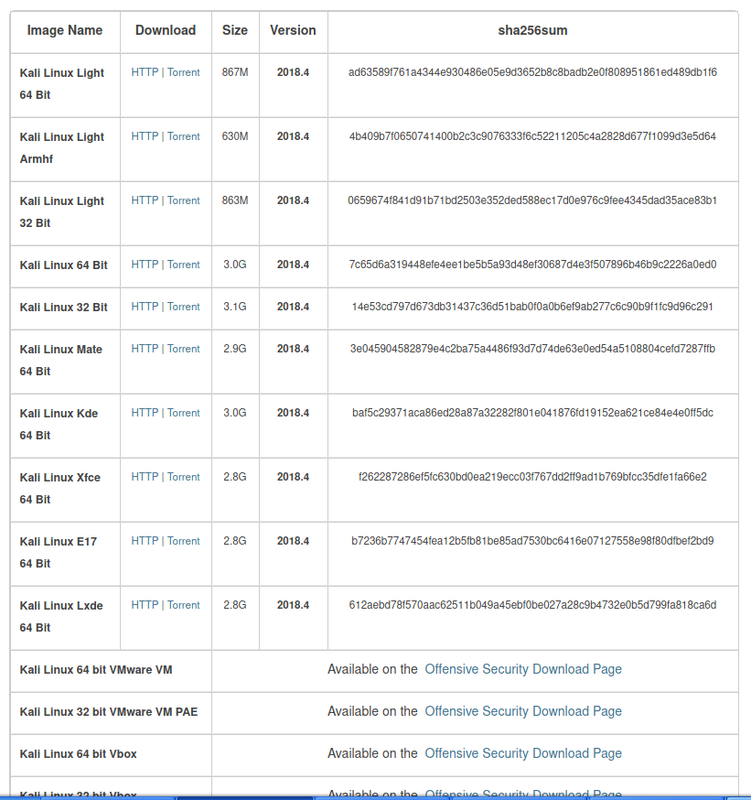 Let's look at these wilds of the Kali Linux versions. Immediately we will clarify that versions differ by 64 Bit and 32 Bit - choose according to your processor. Download links are also of two kinds: HTTP is a regular link to a bootable ISO image, and Torrent is a link to a torrent file, with which you can already download an ISO image. And now let's figure out what the difference between the versions. Almost all of them (except Light) are distinguished by the desktop environment. So that you could roughly represent yourself as an “atmosphere” in distributions, here are screenshots of all versions of Kali Linux. This is the main (“classic”, default) desktop environment. 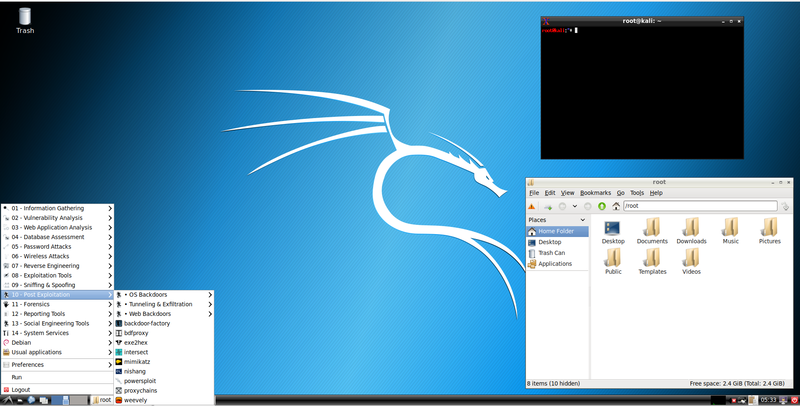 On the website, the ISO image are simply called Kali Linux - without reference to the desktop. 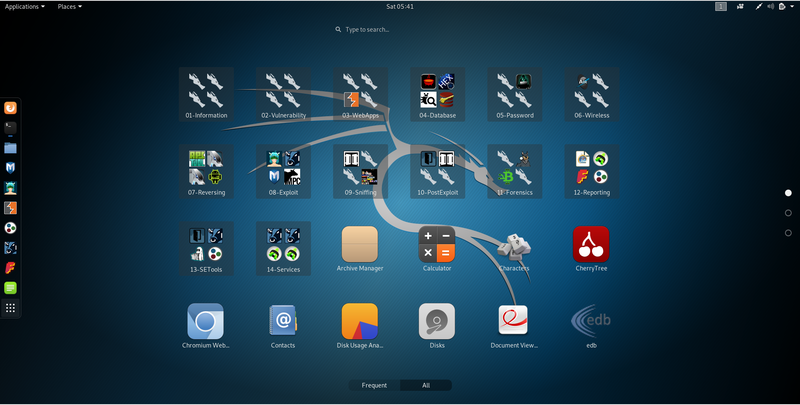 This environment is open for customization and various user widgets and plug-ins. Mate is, in fact, updated GNOME 2. The transition to GNOME 3 brought too drastic changes that not everyone accepted. For example, I personally still don’t like GNOME 3. By the way, GNOME 3 is also used in Ubuntu. So, developers who disagreed with the GNOME 3 concept made fork GNOME 2 and called it Mate. This environment is still kept up to date, it has a classic and perhaps a bit outdated look. This, as well as the following two, are light environments - they are not resource demanding and are recommended for low-power (obsolete) computers. With a cursory feeling (only loaded to make a screenshot) - this desktop environment seemed very nice. 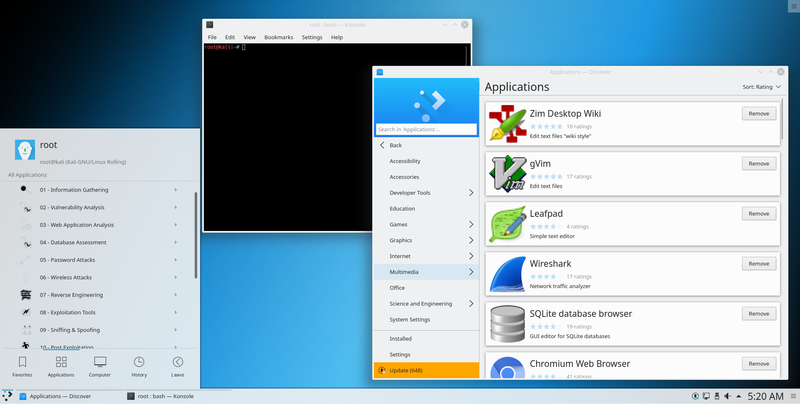 This option comes with the Xfce desktop, its difference is that it only contains the operating system with literally several tools. This option can be a good starting point for creating your own distribution, in which you install only the tools you need. Due to this, the system will consume less disk space, update faster and consume less traffic while updating. If you ask my opinion, what kind of desktop environment is better, then I will answer, the best desktop environment is Cinnamon. By the way, where is Cinnamon? The Cinnamon developers made it so that there are some limitations for the root user in this environment. In fact, to switch to Cinnamon, you also need to create a regular user and work under it. All the details on how to do this are described in here (in fact, everything is quite simple). You do not need to reinstall the system or even download different images if you want to try or switch to another desktop environment. You can install two or even all the options on one system and change your desktop every day. How to do this is written here (see the sixth paragraph). 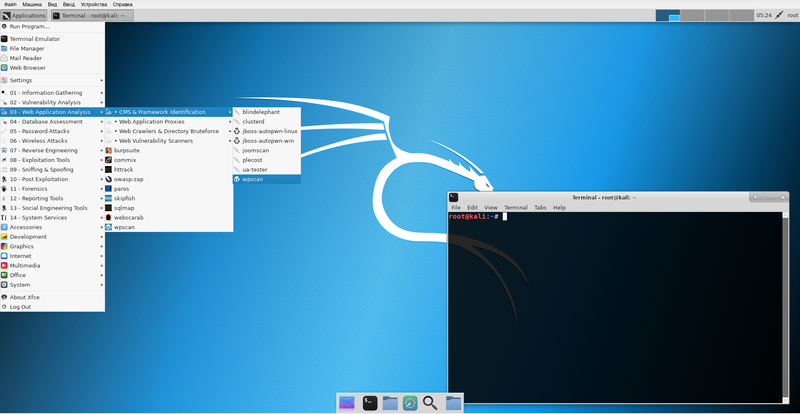 Go to the second official source, where you can download Kali Linux. On this page http://cdimage.kali.org/kali-weekly/ automatically built images are posted weekly. They also differ in the desktop environment. They contain more recent software - that is, you can get a more recent Live system, and after installation you will have to update fewer packages. These releases are called unofficial, untested - that is, something may not work. 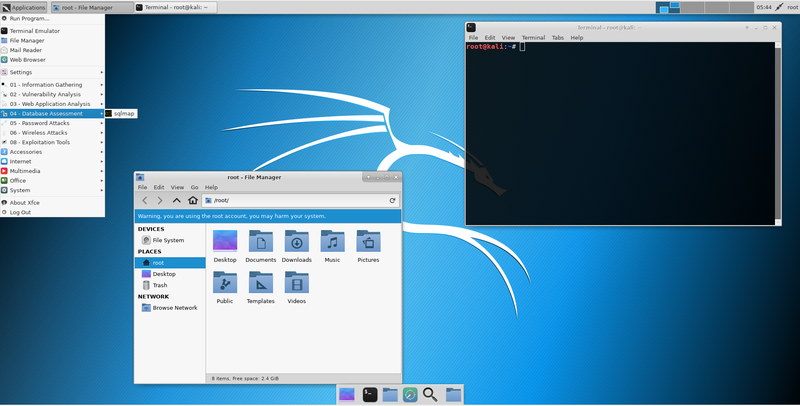 In fact, you can install Kali Linux from a standard ISO image in a virtual machine. This option is designed to accelerate getting installation instance by skipping the installation phase. The size of the images seems too small - perhaps there is a Light version - I have not tested it, I prefer the usual ISO installation. These images are for devices like RaspberryPi and similar. 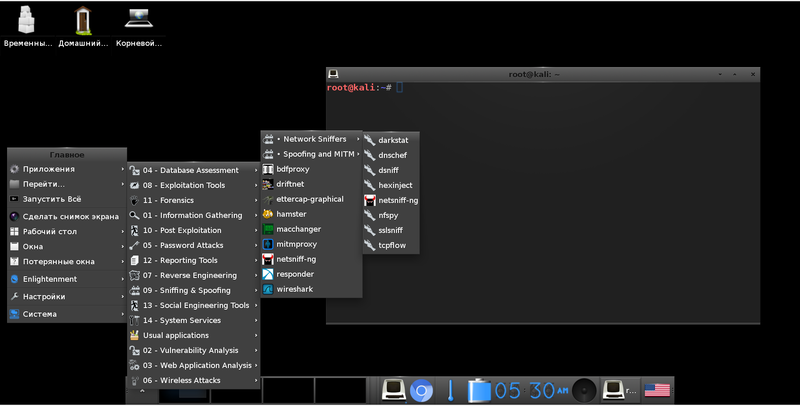 NetHunter is a special Kali Linux version for mobile phones.